About a week and a half ago I found a great deal on chicken breasts so I bought about 10 pounds and made numerous 'freezer' meals out of them. At some point this week we'll be eating these; Stuffed Chicken Breasts with Turkey Bacon and Mushroom Sauce. Honestly I don't use a recipe when I make these, and I tend to have fun with it, adding or deleting at will with whatever we have on hand but the basic idea is the same and it's one you may find to be a quick favorite in your household. I like to make these with slices of ham rolled up inside. The flavor is a perfect blend as chicken and ham go so well together along with the salty goodness of bacon wrapped around to help keep the breast moist and delicious. However I've also made these with chipped beef slices as well as leaving out any form of meat and rolling them up with cream cheese and chives, plain cream cheese or even a mixture of 2-4 kinds of cheeses. While I used to use regular bacon, I switched to turkey bacon because it's wonderful to work with, healthier, and precooked. It holds it's shape and crisps nicely as my husband refuses to eat any tiny bit of bacon that isn't completely crisp. While I have to put these under the broiler to crisp them up with regular bacon, if you use turkey bacon you can skip this step if you like. Pound the thawed chicken breasts flat between two pieces of plastic wrap, parchment or foil. Roll up one slice of ham and secure by wrapping 2 or 3 slices of bacon around each chicken breast. Place seam side down in a baking pan sprayed with non-stick cooking spray or oiled. Mix the soup with the sour cream and pour into the pan surrounding the breasts. Bake at 375 for approximately 1 hour until the chicken is done in the center and no longer pink. You can crisp under a broiler if you want the bacon to be even crisper or more golden brown. Serve with the sauce. This is a family favorite in our house - my kids love this sauce! Fudge Icing or Fudge Frosting - Call it What You May! Whether you call it Fudge Icing or Fudge Frosting this is an excellent recipe if you are looking for a warm icing to pour over a cake. I like that it uses unsweetened chocolate baking bars. As a child this is something our household never had on hand. We only used cocoa. Cocoa is awesome too, but I prefer to use baking chocolate bars for many recipes because the flavor and mixing qualities are so superior. In a microwave safe bowl or in a medium saucepan, bring butter and milk to a boil, immediately remove from heat and add chocolate and vanilla. Stir until the chocolate is melted and smooth. Blend in the sugar, beating until all of the sugar is mixed and the icing is creamy. Pour the warm icing over the top of completely cooled cake. Let set up and serve! Mmmm just like Grandma makes! My husband and I love whole grain, nutty, nutrition packed breads. Last week we tried two new Grains & More versions by Arnold Bakeries and I'm really excited to tell you... they are good! First off I need to mention that Arnold Bakery may not mean much to someone in the Midwest. Like many companies they go by different names in different parts of the country to Arnold Bakery Breads in the Midwest will be found under the Brownberry name. Ahhh! Now you know the bread I'm talking about right!? The new Grains & More styles available are Double Fiber, Double Oat, Double Omega and Double Protein. The two (2) versions we tried are the double fiber and double protein. The double protein version as 100% multi whole grains - 19 grams of grains with 14 grams of protein in every 2 slices. That is double the amount of protein you'll normally find in bread. With a 16 year old son and a husband who lifts weights and both of which love sandwiches, the extra protein is a perk that they don't even know they're getting. I expected the bread to be dry, heavy or crumbly but amazingly, had I not read the package, I would never have known they protein was doubled. Hearty and healthy yet very soft and delicious. The second loaf tried is their double fiber version. This version had less of the grains and seeds of the other version so my kids liked this version best. It was soft and even textured like a typical wheat bread with no inclination that you were getting double the fiber! 100% whole grains with 45% of your daily fiber in 2 slices, it's not only an excellent source of fiber, but you will never know it! Best of all for most of the mothers I know, they are not made with high fructose corn syrup! As wonderful as my husband and I think whole grain, wheat breads are, our kids of course, like most young kids were always partial to white because it's always been softer with a smooth texture and easier to eat. Here is a helpful hint to get your kids started on the path to healthier eating; When you make their next sandwich use one slice white and one slice wheat! The two-colored sandwiches are fun and creative so the kids love having a 'colorful' lunch choice while you know they are getting nutrients as well as eating a sandwich that fills them better than an airy white bread and you are acclimating them to eating whole grains so you can slowly switch to both slices being wheat and you've started your child down a path of healthy eating for life. When it comes to alcoholic drinks I'll be upfront with you readers... I'm an idiot. Yep, it's true. I'm basically a non-drinker so I'm clueless when it comes to mixed drinks. I am not anti-drinking and I will drink alcohol... it just can't taste like alcohol. This is why I prefer a virgin daiquiri or even just orange juice, hold the vodka. LOL. The only thing that doesn't fall into this heading is wine. I like to sip a nice glass of wine on the deck on a warm summer evening, on the beach with the ocean lapping at the sand or in the case of last weekend; at a cabin in the woods by the lake. It's very relaxing! But mixed drinks? I'm a babe in the woods. I have tried a couple of the Rose's brand drink mixers and as long as they are mixed in fruity drink, I tend to like them. Sometimes I like them even better when I leave the alcohol out though. While I used an image of the mojito mix for this recipe, it's actually for one of my favorite fruits in the world; the Mango. I know people hate recipes without amounts... I do too sometimes - but this is one of those things where you just have to go by your own personal taste. Mix some of the mixer with a mango, some frozen cubes, a little zest from the lime and ice. Blend in a blender and then stir in a little bit of the lime juice to give it a kick. Add more or less of any of the ingredients based on your own tastes. It's like a mango fruit smoothie. This is one of those recipes you'll probably find in almost every old church or school cookbook you have. It's a 'Grandma' recipe and one that doesn't shout out to draw attention to itself. I think it's more of a bar that I picture two housewives in aprons sharing at the Formica kitchen table back in 1957 while their children play nearby. On the flip side I also think that because of it's strawberry layer and the glaze on top it's one that would be very pretty on a dessert tray at the holidays. I make a bar similar to this with cranberries, which is why I decided to post this one for those that may shy away from a cranberry filling but may already have strawberry jam on hand and can whip these up in no time at all. In a bowl combine the flour, brown sugar and butter. Mix until crumbly. Press into greased 9 inch pan. Bake at 350 over for 15 minutes. While baking, combine the filling ingredients except the strawberry preserves. Beat on low until well blended and set aside. Spread the strawberry preserves to within 1/2 inch from edge of the hot crust. Sprinkle reserved filling over the strawberry layer and return it to the oven and bake an additional 20 to 25 minutes until the edges are lightly browned. In small bowl combine all glaze ingredients and stir until smooth. When the bars are completely cool drizzle with the glaze mixture. With my love of everything cooking, baking, recipes and cookbooks you would probably think I have a number of favorite 'cooking shows' on television that I absolutely *must* watch. If you thought so however, you would be wrong. It just so happens that I quit watching tv a decade ago. That makes me sound awfully old doesn't it!? LOL. I'm only 38 but yes, it's true; I don't watch tv. I quit watching 10 years ago this month actually. Turned it off and haven't missed it since. That doesn't mean I live in a cave though! We still have tv's in our home (I'm not 'anti' television... I don't have any political stances to take against it... I just don't personally watch it). But the internet keeps me in touch with anything and anyone I want to know about. I saw a clip of Paula Deen cooking once and I just liked her immediately. She was making (something?) and she licked her fingers. She said that's what God gave us hands for and to use them! She then licked her fingers, washed them, dried them and kept cooking. I decided right then and there she was about the *only* tv cooking star that measured up to my own standards. Why? She was real. The rest are all scripted and so incredibly fake with their conversations and their set-help does all the real work. I just like Paula. And this is one of her recipes. In a small bowl, beat the cream cheese, almond extract, and sugar until fluffy. Fold half of the chopped almonds into the cream cheese mixture. Separate 1 can of dough and assemble into 4 rectangles. Firmly press the perforations to seal. Press or roll each piece of dough to form a 7 by 4-inch rectangle, and spread each with about 2 tablespoons of the cream cheese filling to within 1/4-inch of the edges. Starting at the short end, roll each rectangle tightly into a cylinder. Repeat with the other can of dough and remaining filling. Place on a plate, cover with plastic wrap, and chill until firm, about 30 minutes. Preheat the oven to 350 degrees F while the rolls are chilling. Remove from the refrigerator and cut each roll into 4 slices. Place 1/2-inch apart on un-greased baking sheets. In a small bowl, combine the egg white with 1 teaspoon water. Brush over the swirls. Sprinkle with the remaining chopped almonds. Bake for 18 to 20 minutes, until light brown. While the swirls are baking, combine the glaze ingredients in a small bowl. Cool the swirls for 3 minutes on wire racks placed over a sheet of waxed paper. Drizzle the icing over the warm swirls. Back home from a weekend 'getaway' at the cabin and back to work! When it comes to cookies it seems you can hardly go wrong. Thick or thin, crisp or cake like, chocolate, pumpkin, sugar cookie, molasses or peanut butter; additions of chocolate chips, nuts, peanut butter, candy, coconut, fruit... you can do almost anything with and to cookies and they are still good! I've posted a few recipes over the past couple years that started out with a cake mix. They are so quick and easy that anyone can make them (even a 4 year old, with help when it comes to the oven!) so when I saw this recipe a year (?) or two ago I jotted it down. This one starts out with not a cake mix, but a brownie mix. I think it originally came from P*llsbury. Heat oven to 350°F. In medium bowl, beat brownie mix, melted butter, cream cheese and egg 50 strokes with spoon until well blended (dough will be sticky). Drop dough by rounded tablespoonfuls 2 inches apart onto ungreased cookie sheets to make 24 cookies; smooth edge of each to form round cookie. In small bowl, mix powdered sugar and peanut butter with spoon until mixture forms a ball. With hands, roll rounded teaspoonfuls peanut butter mixture into 24 balls. Lightly press 1 ball into center of each ball of dough. Bake at 350°F. for 10 to 14 minutes or until edges are set. Cool on cookie sheets at least 30 minutes. Back in 1998 I attended a family reunion in South Dakota and the catered dinner included the most delicious roast. While I grew up with the typical salt and pepper seasoned roast surrounded by onions, potatoes and carrots, this one was blackened with a salty, lemony crust that was just... amazing. It took a lot of phone calls on my part to track down the caterer but I finally did, and got her 'recipe' by voice, over the phone. It called for 2 days worth of cooking and work but the end result was so good, it was worth it. However! Now that my kids are older and I'm far more busy than I was when they were all under the age of 7, I don't have time to make our favorite roast. Instead, I had to find the shortest short cut I could... and that would be this version - to be used when I need something that night but have no time to cook it. Place the roast in a crockpot. Add just a bit (1/4 cup) of water poured over top the frozen roast so the seasonings will stick nicely. Cover the top with a layer of lemon pepper. Now cover that layer with garlic salt and finish with a third layer of fresh cracked black pepper. You can add potatoes to it if you like, or not. Up to you. Serve straight from the crockpot, or if you do have just a couple minutes extra, transfer it to an oven safe platter or baking sheet and put the seasoned side under the broiler for just a couple minutes to crisp it up. This recipe is obviously not good for anyone on a low salt diet. For the rest of us? Yum. I love my Swedish heritage and I enjoy embracing it in some of my home decorating, sweater styles I love, the embroidery work on heirloom pillowcases and more. I also love a good Scandinavian cookie or coffeecake with my coffee! It's funny that the addition of cardamom to a standard coffeecake would make it Scandinavian... LOL. But either way? Yum. Preheat oven to 350 degrees. Grease a 9-inch tube or bundt pan with butter and dust with cookie crumbs. Combine flour and baking soda in small bowl -set aside. Beat sugar and butter until fluffy (about 3 minutes). Add eggs, one at a time, beat well after each addition. Add cardamom and cinnamon and the flour mixture. Beat until just combined then add sour cream and mix 1 more minute. Bake 50 minutes or until done in the center. Let stand 5 minutes, turn out of the pan to cool completely and dust with confectioner's sugar (powdered sugar/icing sugar) to serve. My regular readers and subscribers (you can sign up with the link to your right) know that I love my gravy recipe. I start with a broth that includes vegetables that I later strain out and discard and then I make a a paste with the butter and flour to thicken it. My gravy recipe is so incredibly good tasting but I really love it because it's a 'make ahead' recipe too. You can make it ahead of time and a day or two later pull it out, reheat it, add the drippings from the turkey and serve it just as wonderful and smooth and delicious as if you just spent an hour in the kitchen making it from scratch. While I love my gravy recipe I also keep my eyes open for other recipes of course, and this one might be a favorite of my readers who like to buy their chicken broth at the store, in a can and who either do not have or maybe don't want (?) to use drippings from the turkey or chicken to flavor it. If you don't have drippings from the bird to flavor the gravy try this one. I'm also thinking that if you use a vegetarian version of the broth or vegetarian boullion cubes to make the broth - this could probably be considered a vegetarian option for your gravy. Combine broth, celery, carrots, onion, peppercorns, and bay leaf in medium saucepan. Simmer, uncovered, over medium heat 20 minutes. Strain broth; discard vegetables and seasonings. Melt butter in medium skillet; blend in flour. Cook until mixture is slightly browned; gradually stir in seasoned broth, Kitchen Bouquet and salt. Cook over medium heat, stirring constantly, until mixture comes to a boil and then cook for about 1 minute. With Autumn weather and Thanksgiving right around the corner you'll want to start keeping your eye out for recipes that are fitting for the season. When I saw this year a couple years back I just smiled both for the fact that it was obviously an 'old Grandma recipe' but also quite Southern with it's use of both leftover biscuits and cornbread for the stuffing. Since I'm Southern at heart and waiting oh-so-patiently for God to see fit to send me back that way I love to make yummy Southern dishes and dream I'm already there. This recipe is particularly going to help those who want to make a simple Thanksgiving Dinner with the chicken already cooked and diced or cut up and blended with the stuffing. It would travel well, could be made ahead of time and taken with to reheat at a family gathering, or could be made the night before and just popped into a hot oven during a busy day. Either way if you have biscuits and cornbread on hand to use up or you want to buy or make some for the recipe, give it a try and let your Southern spirit soar... if only for a day! Clean the chicken from the bones and reserve both the chicken and the broth separately. Crumble bread and biscuits; add celery, onion and seasonings. Add eggs, mix well. Add hot broth to make a very thin, soupy mix. The dressing will soak up a lot of broth, so you might even need to add another cup or two after the first time you stir. Mix well. Bake at 350 degrees in a greased deep baking pan for 1 hour or more. Important: Stir dressing every 10 to 15 minutes so it won't form a crust. During the last 20 minutes, fold in the cut up chicken. Serve with giblet gravy. Something I never once had in my childhood, my mother never made and I didn't know I liked until I was married with children is... carrot cake. First made in the early 1990's I discovered carrot cake with cream cheese frosting is a dessert fit for a king and I've been hooked ever since. I typically make the nice 'fattening' version. I use eggs, I use butter and I use oil. Sometimes I do substitute applesauce for the oil but honestly applesauce doesn't last long around here! My son and husband can have an extra large jar of it gone within a day or two so for that reason only I don't regularly substitute applesauce for oil. This is a recipe for a 'lighter' Carrot Cake from a cooking magazine I bought about 8 years ago. I have made this version and it was good, but because I don't keep egg substitute on hand and I've already explained about the applesauce, you'll probably make this one more often than I do. Considering this version has a third less calories, less than half the fat and less cholesterol maybe I should buy my applesauce and egg substitute in bulk! Combine the first 7 ingredients for the cake down to the flour and dry ingredients. Mix smooth. Combine the dry and add to the buttermilk mixture. Stir in the carrots and pineapple and nuts (if you use them). Bake in 3 prepared 9 inch round pans at 350 for 30-35 minutes until done. In a saucepan combine the glaze ingredients and boil 1-2 minutes. Remove from heat and pour over warm cakes. Cool completely before removing from pans. Combine all the frosting ingredients except the sugar and then add that last. Layer the cakes with 1/3 c frosting between. Frost top and sides of cakes. Last night my oldest daughter got home from cheerleading at 8:00 pm, went upstairs to do her homework by 8:05 and was back downstairs asking me if I thought we could find some Ossau Irraty style cheese for French Class tomorrow. Mmm... in our little Midwestern Mayberry town with one little Mom and Pop grocer? Uh, I don't think so. And since it was now about 8:15 pm there wasn't time to scour the metro area nearby hoping to find it either. She brought out her list of foods and her second choice (purely by mistake on her part) was Black Pudding. I smiled. "I know what Black Pudding is and I really don't think you want to make it for class tomorrow...."
After she learned it involved thickening blood she decided that perhaps she would save that one for another time. I glanced over her list of French foods from the Basque area and saw one I thought was do-able. Basque Touron. 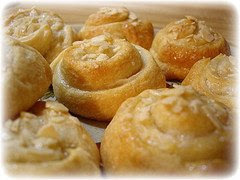 A candy made from honey and almonds similar to almond paste or marzipan. Looking online I found a site that offered images of brightly colored touron (or sometimes spelled Turron) candies. Many times red, but other brightly colored versions, some with nuts added or sometimes chocolate... pressed into a loaf pan and sliced to serve. A quick trip to the grocery netted me the almond paste, but at $5 per small can I decided the kids in French Class could get a tiny smidgen of a taste - not a whole slice! Divide the almond paste into 3 or more portions, depending on how many colors you want to use. I used three. Work a bit of color into each portion. Roll each into a log with your hands and then gently roll out each log into a strip about 2 inches wide and 10 inches long. Stack the colored strips on top of each other, gently roll them again to bond and then using a sharp knife, cut lengthwise down the center making two strips and lay one on top of the other doubling it's height. Again, gently roll a rolling pin on top to bond them, flipping the strip over to each side to roll. When you have a finished strip, cut into bite sized portions. I got 29 bite sized samples from 1 can. *You could add some coconut, crushed pistachio's or other nuts or chocolate to this recipe too! Back in 2000 we were relocated again, this time about 1 1/2 hours from my parents. This meant we saw them a little more often, but it was also just 3 months before my Mother was diagnosed with breast cancer. When that happened I ended up spending even a little more time there of course and since reading is something I love to do I passed some of the time reading everything I could get my hands on. She had a pile of old Country Woman magazines from 1990-1992 in a pile that she had received from my Grandmother (who received them from???) and I devoured them front to back. The photos, the stories... and the recipes! This is one of the recipes featured in one of their old magazines. Luckily recipes like this never go out of style - not even 18 years later. Melt butter and chips together. Beat eggs with sugar. Add coffee and water. Combine baking powder and flour and add. Sprea in greased 9x9 pan. Bake for 30-35 minutes at 350. Cool. Spread with filling. Mix and spread over. Drizzle with glaze. Chill. Store in the refrigerator. Earlier this week I had an intense craving for whole grain pancakes. While running errands or sitting at a kids football game it's all I could think of. Finally I just decided to give into the craving and make a batch. This particular recipe started out as a copycat version from a famous pancake restaurant (I believe...) that I went ahead and tweaked a bit to my own tastes, but if it did originate with a restaurant, then I would like them to tell me how they manage to cook them because I found cooking them to be difficult. Not making them, cooking them. With all that whole grain flour, oatmeal and nuts the darn things wanted to brown too quickly. LOL. I can't say that were pretty (they weren't) but I had them no less than 3 times this week and can't even think about them without craving them again! They are that good! Lightly oil a skillet or griddle and preheat to medium. Grind your oats in a blender or food processor so they are fine textured. Add all the dry ingredients into a large bowl and then add the rest. Stir well or mix with a mixer. Using 1/3 cup of batter, cook the pancakes 2-4 minutes on each side until brown. Look at all this whole grain goodness! Not a pretty pancake... but delicious. For a few years when the children were small I bought canned Spaghettio's. After they started school I just stopped buying canned pasta. I didn't buy it for the next few years until we moved to our current city/state and I returned to work outside the home. With the kids at home during the summer while I was at work I wanted them to have a variety of lunch choices; sandwiches, burritos, quesadillas, macaroni and cheese, soups, pasta, hot pockets, etc. I bought a few cans of the ravioli style pasta because it was on sale and I thought perhaps it would be filling for my (then) 12 year old son as well as easy to cook in the microwave. It was, and he loved them. The bigger surprise is that in the last 6 months or so my oldest daughter has come to like them too (probably a good thing as she goes to college next Fall and may be living on canned pasta and ramen noodles! LOL). My family doesn't really care for casseroles and they have never really been met with enthusiasm in our household but with the cold weather setting in soon and the cost of groceries being sky high we may need to resort to some good old fashioned heart Midwestern 'casseroles' (or 'hot dish' if you are from Minnesota) that use (cheap) dry pasta and ground beef. Brown ground meat in a skillet, continually chopping the meat so it is very small. Add the celery and onion half way through cooking. While the meat/vegetables continue to brown, cook the macaroni according to box instructions. Drain. Mix the meat and pasta with the tomato soup and a half can of water. Spread in a greased 9x13 casserole dish. Sprinkle cheese until top is all covered. Cover with a lid or foil and bake at 350 about 35-40 minutes until heated through. Remove the cover for the last 5-10 minutes of baking until the cheese is golden brown. Earlier in the week I mentioned stopping into my local 'mom and pop' grocer and finding they had a great deal on boneless, skinless chicken breasts. I bought double what I normally would have (for less than half the price!) and came home to make 5 different freezer meals out of it. One of those meals was a basic breaded chicken breast, but different in the fact it used a package of store bought stuffing as the breading. Since for whatever reason (?) I actually had a box of this in the pantry I decided to give it a try. Yesterday was yet another crazy scheduled day around here (aren't they all?) so at 3:00, just as I had to run out the door to run errands I grabbed 5 of them from the freezer shelf along with a container of country style mashed potatoes I had froze a couple weeks ago - popped them into the oven to bake for two hours and left on my way. I knew my oldest daughter was going to be home within about 15 minutes but this way dinner would be in the oven, no work on anyone's part and we would magically have a full dinner of baked chicken breasts and mashed potatoes for dinner when we walked through the door! In the end - they were good. There are a couple tweaks I'll make next time - I'll add them at the bottom of the 'recipe'. Crush or process the bread stuffing and seasoning mix until you have large, uniform crumbs. Spread each chicken breast with mayonnaise (about a tablespoon) and press each breast into the crumb mixture, both sides, pressing to coat. Lay in a greased/oiled pan to bake immediately or wrap in foil to freeze. Bake at 375 until crispy and done in the center. This is about 35-45 minutes if thawed and 1 1/2 hours if frozen. *Tweaked; two of my kids requested that I 'stuff' these before breading next time as our family is very fond of stuffed breasts with cream cheese, ham, spinach, cheeses, etc. One of them requested a sauce to use with it and I suggested cream cheese and bacon bits, microwaved to melt. She tried it and loved it - and this is the 'stuffing' we'll be using next time I make these. The second tweak is the stuffing needs salt and pepper! It might just be our brand (a store band version) but it had little or no salt so the spices and herbs were lost until I added salt to make them pop and bring them out. Delicious! Originally this recipe came from a couple different sources. The first being the traditional Christmas fare that you make with a bit of jelly in the center around the holidays but one year back around 2000 I was thinking about pressing a chocolate kiss into them instead of spooning in a bit of jelly. Instead, while looking through a recipe magazine I subscribed to, I found a recipe for Chocolate Thumbprints. This sounded yummy and for the next couple years I made them (much to my families happiness). Finally, about 5 years ago I found another version - this one using caramel as the filler with a pretty drizzle of chocolate over them. This was more my style! I love caramel but don't have a huge love of chocolate so the nuts and caramel in this version were a delicious change from the cherry jam or chocolate. So many possibilities! This version comes from the Better H*mes and G*ardens magazine from a few years ago and is a wonderful 'Fall' cookie to serve! Separate egg and place yolk and white in separate bowls. Cover and refrigerate the white portion until later. In a large mixing bowl beat butter with an electric mixer for 30 seconds. Add sugar and beat well. Beat in egg yolk, milk, and vanilla. In another bowl stir together the flour, cocoa powder, and salt. Add flour mixture to butter mixture and beat until well combined. Wrap the cookie dough in plastic wrap and chill for 2 hours or until easy to handle. In a small saucepan heat and stir caramels and whipping cream over low heat until mixture is smooth. Set aside. Slightly beat reserved egg white. Shape the dough into 1-inch balls. Roll the balls in egg white, then in pecans to coat. Place balls 1 inch apart on prepared cookie sheet. Using your thumb, make an indentation in the center of each cookie. Bake for 10 minutes at 375 or until edges are firm. Repress the thumbprint if it baked out and puffed up again. 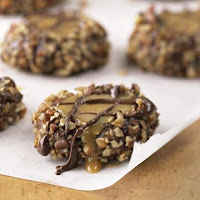 Spoon melted caramel mixture into indentations of cookies. Transfer cookies to wire racks; cool. In another saucepan heat and stir chocolate pieces and shortening over low heat until chocolate is melted and mixture is smooth. Let cool slightly. Drizzle chocolate mixture over tops of cookies. Fall is here! Time for potatoes, gravy, hearty soups and stews and homemade breads... and roasted chicken! I admit... I love potatoes and gravy. It's a comfort food that goes back to my childhood in the freezing cold Midwest and I've never lost my love of gravy even when we lived in Southern California and Nashville, Tennessee! Todays post however is about traditional chicken or turkey gravy. This particular recipe is one I make every Thanksgiving no matter what even if I cheat during the year and make a quicker more simple gravy for an everyday meal. The most awesome thing about this particular recipe? You can make this ahead of time and it reheats perfectly without gelling up! Bring to a boil, reduce heat and simmer for an hour. Strain the vegetables out and disgard, leaving the broth. If it's reduced too much, add water to make it 6 cups. Even though this recipe is just about the broth... I'm going to add the rest of the recipe to make it into gravy. I've already posted it on my site previously but just in case you missed it, here it is again. Enjoy! Mash 6 T butter with 3/4 c flour until it forms a paste. Bring your 6 cups of broth to a boil and whisk in the first chunk of flour/butter. Whisk each in one at a time and whisk until blended and cook until thick. At this point you can cover and cool it in the refrigerator for up to 2-3 days before continuing. When you are ready to make your gravy bring it to a slow boil, reduce the heat a bit and add anywhere between 3/4 cup to 2 cups pan drippings of your roasted chicken or turkey. When hot, serve! Autumn is a time of year when your body starts to crave foods more substantial than light citrus fruit and salads. I can feel the urge for potatoes, soups, hot, warm meals. 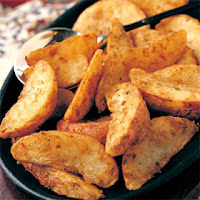 This photo is from a search engine but it's a yummy side dish that says "Fall and Winter" all over it; Potato Wedges. Typically I just open my cupboard and grab spices to add but I realize that some people want a recipe. When I found this recipe (I think it's from circa 1992?) it was basically everything I use in my 'open the cupboard and throw it in' way of cooking. I do add onion powder to mine typically too - but that's up to you. This is a great recipe to 'start' with and then improve by tweaking for your own family and their tastes. If you like it, go ahead and make up a double or triple batch of the spices and put them in a baggy or container in the cupboard to use next time! I may never buy store bought again. They were going more stale and dry by the day and it was either finding the time to make pita chips out of them or tossing them in the trash. Yesterday I had to bake cookies for a football dinner so the oven was on anyway and I was also going to be in the kitchen canning 3 more pints of salsa to use up those kazillion little tomatoes that would also go bad if I didn't do something with them so... it was the day to finally make the pita chips. Is there a precise recipe? No. Not really. It's all going to depend on your tastes. My family loves garlic so I chose to use garlic as the spice of choice. And even though 2 cloves may be the norm for a batch this size, I used more like 6. LOL. If you don't like garlic - just use salt and pepper. You don't need to add spices at all if you like them plain or will be pairing them with a great dip! You can also choose to sprinkle them with everything from oregano or chili powder to a mixture of garlic and parmesan. You choose. Have fun with it. Brush the triangles with a mixture of the garlic and oil and salt and pepper. Cover both sides. Bake on a baking sheet or stone at 350 or 375 for about 12 minutes until the chips are crisp and the edges are brown. Don't over bake to a very dark brown or half may burn. Do not under bake or they won't be crisp in the centers. Flip and move them a couple times during baking to assure they are evenly baked. Sprinkle with more salt straight from the oven if they need a bit more flavor. Serve with your favorite hummus or spinach dip recipe or just eat them plain because they are really so incredibly they don't need a dip! Take a package of pita pockets and make 4 cuts from the flat end to form 8 triangles each when the 2 sides are pulled apart. Brush them with olive oil on both sides and place them in the hot oven to bake for about 10-12 minutes until crisp. While I'm sitting here sipping iced coffee I decided to do a blog post on it even though I didn't actually a 'recipe'. It's frugal and yummy; it uses leftover coffee! My coffeepot still held 2 cups of coffee from this morning and since I have a Brewmaster style coffeemaker it doesn't have a glass carafe and my coffee doesn't get that bitter, burnt taste so using leftover cold coffee from the morning isn't a problem when it comes to flavor. If you want to make some iced coffee give this a try... remember, I didn't measure so I'm going to guesstimate. Change the amount to your own taste! Now, back to finishing off my iced coffee and reading emails before I take my daughter back to the doctor for a checkup on her broken wrist! Part of living in an area of the country that gets 4 distinctly different seasons is that your body tells of the shift in temperature and atmosphere by instinctively craving certain foods and losing a craving for others. In the Fall I find myself wrinkling my nose at lettuce salads, lemony grilled shrimp and light, citrussy fruits and instead the thought of creamy homemade soups, homemade bread, pumpkin bread and apple pie all sound delicious. Last week jumbo grilled shrimp sounded amazing and was on sale so I bought two pounds. As the week went by the cooler, rainy weather set in and I realized my body was spending more time considering the goodness of a hot garden vegetable cream soup than icy cold crisp lettuce. Time to get that shrimp made! Our meal last night was a spicy marinated grilled shrimp and peppers, cheese tortellini pasta salad with artichokes and raw veggies with dip. Our last hurrah before the leaves start to fall and the snow starts to fly I'm afraid. Mix all the ingredients for the marinade. Add the shrimp and vegetables (I like to put the vegetables on the bottom and the shrimp on top to keep the shrimp from being 'cooked' by the lemon juice and acids in the marinade. Let set for 2-12 hours in the refrigerator. The longer the stronger, and the more immersed the shrimp, the stronger the flavor. Turn occasionally to evenly distribute the marinade an hour or two before grilling if you haven't turned it at all yet. Thread on skewers - I do the vegetables separate from the shrimp but that's up to you. The vegetables will take about 10-15 minutes to grill over medium heat while your shrimp will be done as soon as it's pink on both sides - about 3-4 minutes for each side. It was only after my son had ate about 5 of them that he actually looked at what he was eating and said, "What? No way. Mom did you make these out of hot dog buns!?" At 4:30 yesterday afternoon I changed my mind on what was for dinner and completely changed the menu. In doing so I really wanted to serve garlic bread with the meal but I make my own bread from scratch and didn't have time. When I opened the freezer I saw 2 packages of wayward buns. You know the ones... a week or two ago you served brats or Italian sausages (or hot dogs) and you had one or two buns leftover so you threw them into the freezer where no one will ever use them because the next time you need buns you'll use a new package and serve all 8. Those one or two buns are left freezing and drying out before you find them a month later and throw them out! LOL. And spread it on each slice. Baked at 375 for about 10 minutes until the edges were golden brown. The end result was delicious as well as being frugal (a package of cheap store brand buns can be bought for under $1) and the taste was perfect. Store bought buns are very light and airy in texture with just a hint of sweetness which blends well with the garlic flavor of the spread. While we lived in a small resort town in Northern Minnesota I discovered my undying love of wild rice. I'm not sure I ever make it the same twice (much like uh... all my recipes?) but use this as a game plan for your dinner tonight and add/delete as your family likes (leave out the chicken, add diced zucchini, etc.). If you happen to live in a part of the country that is still experiencing 90 degree weather, tuck this one away for a cool January evening instead. In a saucepan over medium high heat, saute the onion, carrot and celery in the butter until tender but not brown. Stir in flour and blend. Gradually add the broth. Stir in the rice and chicken, season to taste and bring to a boil over medium heat. Cook and stir 2 minutes until thick. Stir in the milk, cook an additional 3-5 minutes and serve. This will make about 8-10 servings. In my part of the country Autumn is well, almost here. Today it certainly feels like it as it's chilly, rainy and cold. We may not get our 'real' Autumn until next month (tomorrow is supposed to be back up to 70 degrees) but I'm in the mood for spice cake, pumpkin bars and carrot bread... all signs that my body is gearing up for Fall. This is a recipe for a pumpkin cake that I like to call 'cheating' because you start with a base of a yellow cake mix. Although I had never purchased a yellow cake mix in the first oh, 14 or 15 years we were married, I'm finding it is a nice thing to have on hand for last minute bars and cakes and breads like this one. I regularly keep a cake mix of every flavor on hand now 'just in case'. Combine cake mix, pumpkin, brown sugar, eggs, oil, spices and milk together in a bowl and beat about 3-4 minutes until blended and smooth. Bake in a greased 9X13 inch pan at 350 for 35 to 45 minutes, or until the cake springs back lightly when touched with a finger. While the cake bakes, combine the topping ingredients in a small bowl, stirring until blended. Spread the topping over the warm cake and broil about 5 to 6 inches from the heat source for about 3 minutes, or until the topping is bubbly and browned. Our household loves truffles. I started to buy them when we used to live right down the street from a Harry & David outlet store but soon started making them myself. The photo above is of the truffles my daughter made for her boyfriend last Valentines Day - they were amazing! She made him caramel and mocha flavors but when and if I have a truffle (because I don't generally care for chocolate) I like a nice almond truffle. When I saw this recipe for them I decided I had to keep it in my files. Yum. An almond truffle with a hot cup of coffee - doesn't that sound fabulous? Combine evaporated milk and sugar in small saucepan. Cook over medium heat until mixture comes to a full boil. Boil 3 minutes, stirring constantly. Remove from heat. Stir in chips and almond extract, stirring gently until smooth. Chill mixture about 45 minutes until it can easily be shaped into balls. Roll into the crushed nuts. Chill until ready to serve. You're home from work or running errands and you are starving. You put your keys and purse or bags on the kitchen counter and open the refrigerator and stare into it. Quickly skimming the available foods you see a container of last nights chicken, some oranges, some grapes, lettuce, celery, a couple more containers. But you don't want to wait 2 minutes to warm something up and you don't want to wash any fruit. You just want something now. Instead you close the refrigerator, open the cupboard and spy a package of PopTarts or a bag of chips. Instant gratification. You open. You eat. And you just made a lousy choice. LOL. Now, what this post is not actually about ... you. It's about your kids. You are more likely to make a better choice than the kids are and perhaps eat that orange, or grab a carton of yogurt but for hungry kids? I know my three want 'quick and easy' and although my two girls are apt to grab leftover Italian pasta artichoke salad or some tortilla chips with cheddar cheese, my son? Well, he would grab a PopTart. But over the years I have found that by preparing 'healthy' foods and making them quick, easy and attractive as well as being strategically placed in the front, middle shelf of the refrigerator they are more likely to grab the fruits and vegetables than junk food. Washing fruits and vegetables and putting them in serving sizes not only makes them quickly available, but it also lets them know immediately the fruit has been washed, cut, cleaned or de-seeded and can immediately be consumed. For vegetables I like to have fresh broccoli, cauliflower, carrots, pepper strips and celery already cleaned and cut to serving sizes as well as making sure the homemade ranch dip is next to it. Fruit like strawberries and apple slices don't last long without starting to go bad after being washed and cleaned, but on the other hand once they are washed, cleaned and put into serving sized baggies or little plastic containers they won't last long anyway because everyone will gobble them up! When and if the berries haven't been ate in a day or so, I simply pop them into the freezer for a great frozen, slushy snack on a later day. I also like to clean and freeze mangoes in bulk this way (which I've already blogged about with photos!). Make it easy to make the 'good' choices and keep the fresh fruit and vegetables front and center and looking appetizing as well as already cleaned and ready to grab in a mad dash out the door or by a very hungry child or adult. I fixed these pork chops for the grill last week and although I had a slip of paper sitting here with the recipe I had lost the picture! It was saved on my laptop... somewhere but I had no idea what file it was put in as it wasn't 'where it was supposed to be'. But my persistence paid off and I found it. Now, when it comes to spices on meat that will be grilled I won't hesitate to say that you can do almost anything byway of mixing spices and it's probably going to turn out fabulous. Ok, not if you are going to do something weird, like adding vanilla and dried orange and sage and cumin on your pork or beef... but within reason and using common sense - you can mix and match and it's going to be oh-so-good. This particular version did not use brown sugar - although another one I did a couple weeks ago did and I'll post that one at some point in the future. Mix the dry ingredients and sprinkle, press onto your meat to be grilled. Best if you can refrigerate it and let it set for at least 30-60 minutes but it is fine if you apply it just before grilling too. Special Note: Don't overcook your pork chops! Pork chops should be moist, easily cut with a fork and tender. People tend to overcook them as todays pork is genetically bred to have little fat and you can't cook them as long as our Grandmothers and Mothers did. Cook until it's no longer pink and it's completely done in the center and juices run clear, but don't over cook or you'll end up with shoe leather and no spice rub is going to help that! Last weekend we took a quick trip 'up North' and stopped in to see my FIL. As we were leaving he told us to go pick some apples from the trees as he uses very few of them and they would just go to waste. Well, we came home with a bag bulging with fresh picked apples and while I was prepared to make and can apple pie filling I decided to try my hand at canning them as slices in simple syrup instead. As usual I gathered 2-3 recipes and read through them. My personal needs were simple; I had no more vinegar left after canning the beets so I needed to make sure I could use a water bath process and they called for no vinegar. Bingo! Apple slices canned in a simple syrup require no vinegar and 25-35 minutes in the hot water bath. Peel, core and slice the apples and place into a large container of water with the lemon juice added. By immediately placing the apples in this mixture you keep them from turning brown. In a saucepan bring the water and sugar to a boil and reduce to a slow boil for about 5 minutes to form a simple syrup. While this is simmering pack the apple slices into 2 quart jars. Pack pretty full but not so hard as to break the slices. Pour the hot syrup over the apples in the jars leaving 1/2 inch head space. Use a rubber spatula, chopstick, butter knife, etc. to release air bubbles from the jar. Seal and attach a ring, process in a hot water bath 25 minutes for a pint and 35 for a quart. Let set 12 hours to cool and seal. Test for the seal, if it didn't seal correctly reprocess. Store in a cool dry place for future use in apple pies, cobblers, desserts and tarts.